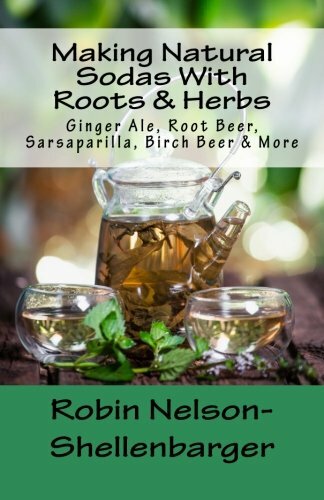 You may think that making a soda with roots and herbs is kind of weird, but really it's not all that strange. You can think of it as carbonating your different teas. It's like drinking a bottle of mint tea, only it's got the fizz to it. Root beer used to be made with all sorts of roots and berries to make that distinct root beer flavor. Ginger was originally made with actual ginger root. Ever hear of Sarsaparilla in the old Western movies? That drink was made with Sarsaparilla root. Birch beer was actually a non-alcoholic drink made with birch bark and other ingredients. Back before you could find a soda in the store, they started out as health tonics made from all sorts of different herbs, roots and spices along with fresh fruit and veggies. Since fruit and veggies were only available through the growing season or region specific areas the dried herbs, roots and spices were mostly used. These ingredients were made into these health tonics to cure ailments people encountered throughout their lives. Such ailments could be from fatigue to the flu. Although not all tasted very good, some became favorite flavors and developed into picnic favorites.